When the announcement was made in the monthly Be Informed Lectures that a member of the Sisterhood of Support (SOS) would be presenting a lecture on “UNDERSTANDING REIKI: One Sister’s Personal Evolution,” the response was so great I immediately added a second date. One of the focuses of the Sisterhood of Support groups is to reframe the trauma of a diagnosis and mastectomy into an opportunity to assess one’s life and encourage the fulfillment of personal goals. 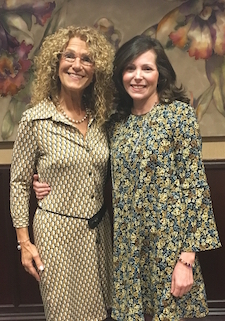 Andrea Brophy is an incredible example of a patient who embraced that calling and is using her newly learned skills for her own physical, emotional and spiritual healing, and sharing it with others. Andrea shared her deeply personal and inspiring breast cancer journey with the groups which ultimately led her to becoming a certified Usui and Karuna Reiki Master. Working at a private practice in Syosset, North Shore Wellness Group, Andrea specializes in working with women challenged with breast cancer. She also works with people faced with many different health issues, as well as those looking to maintain physical and emotional well-being. She uses Reiki to relax patients and reduce their pain and anxiety. 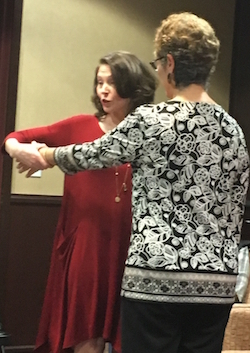 During the presentation, Andrea offered a history of the use of Reiki and how it is presently being incorporated into medical protocols to enhance the effectiveness of treatment. A testament to its benefits, Reiki is increasingly being integrated into many health care settings, including hospitals. In fact, a recent study by researchers at the University of Pennsylvania concluded that Reiki shows promise as a component of supportive care for cancer patients. We thank Andrea for sharing her time, expertise and experience.